Here at Trigene Dental we provide a vast range of dental equipment, consumables, supplies and more. 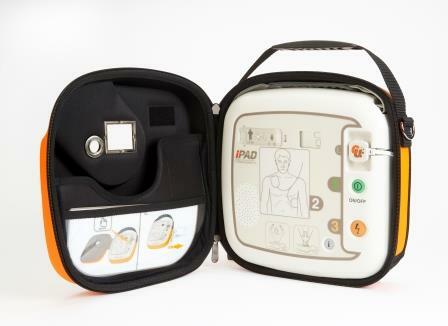 In our latest range we decided to consider Automated External Defibrillators, as an emergency may occur within a dental practice, therefore we now supply the iPAD SP1. The British Heart Foundation evaluate Automated External Defibrillators available within the UK market every three years, to investigate the best and distribute them to built up areas, for example shopping centres and offices, where they will be of benefit and save peoples lives. The iPad SP1 has been selected and will now be placed across the UK with financial assistance from the British Heart Foundation. Around 60,000 cardiac arrests take place out-of-hospital within the UK annually. Trigiene dental appraise how the iPad SP1 has been designed, ensuring it can be used by minimally trained individuals, with easy to use pads and simple switches, for both adult and child modes. A carry case and initial consumables are provided within the pack too. For further details regarding the iPad SP1 features and capabilities, please select the link. If you have any questions about Automated External Defibrillators, please do not hesitate to contact us today.